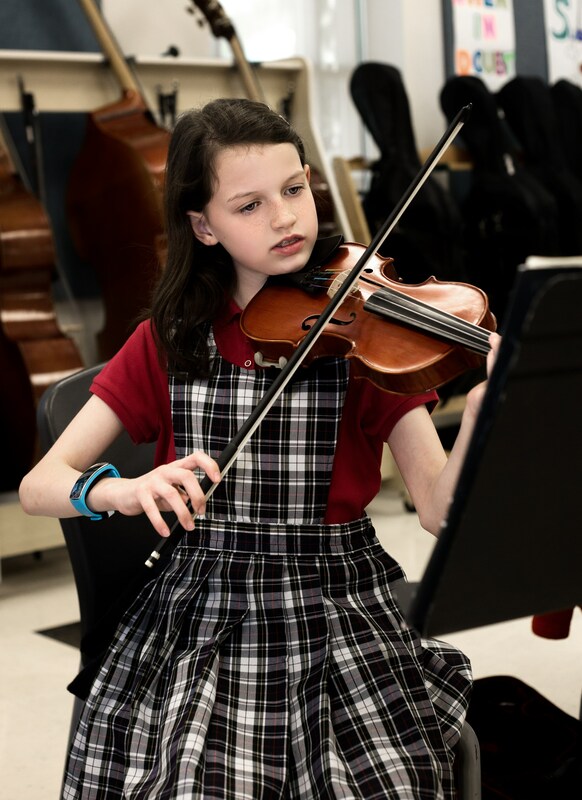 Students experience music on many levels at St. Clement's School. Music is integral to worship in daily chapel services and special events. In the classroom, teachers incorporate music into other subject areas of the curriculum. Students also participate in enrichment or elective classes under the direction of expert musicians. Our music instructors recognize music as an art form for self-expression and communication, and they challenge students to sing and learn to play instruments through classroom instruction and rehearsals. Students experience a wide repertoire of classical and contemporary music. Three-year-olds through fifth graders progress through learning percussion and orff instruments, recorders, and handbells in their music enrichment classes. Fourth through eighth graders may choose to join the orchestra. Seventh grade students may enroll in an elective choir class. Lower school students may also join Musicats, an afterschool singing group, and middle school students can join the Wildcat Worship Team, the school's volunteer contemporary praise band.